Yukon Advanced Optics, a world wide leader in the development and distribution of night vision and sporting optics, stay true to their one simple mission; to produce high quality optics at affordable prices. Yukon's Nightfall 3x44 Night Vision Monocular pulls the cloak of darkness off of impenetrable no/low-light scenarios; the Nightfall transforms night into day with the flip of a switch. The Nightfall monocular features a durable ergonomic housing with a rugged rubber-armored exterior. Inside there's a high-quality 1st generation intensifier that handles total darkness conditions with the assistance of an integral IR illuminator. 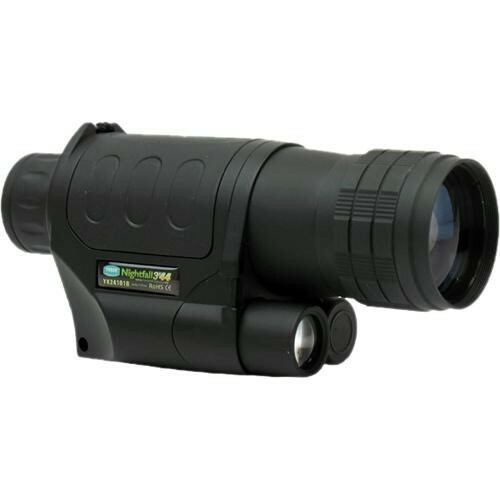 This Nightfall monocular is configured with mid-powered 3.0x optics for outdoor viewing. This user-friendly NVD is well suited for a broad range of recreational and professional applications; home security, hunting, professional surveillance, boating, nature observation, and camping. First generation NVDs are a cost effective night vision solution that provide excellent low-light imaging performance, with respectable levels of resolution. Supplementary IR illumination is necessary when operating a Gen-1 device in total-darkness conditions.